WIA Logo For Use On QSL Cards. WIA QSL Bureaux operate in each State, the Australian Capital Territory and the Northern Territory. There are some differences in their operational methods, but all may be considered to follow the basic operating policies of the WIA as well as the QSL Bureau guidelines of the IARU. To use the facilities of the WIA QSL Bureaux, WIA membership is required. In December 2017, the WIA Board approved an updated policy on the operation of the WIA QSL Bureaus. This policy is available below. WIA Members wishing to avail themselves of the QSL Bureau services, must first register their callsign(s) with the Bureau appropriate to their location. Contact details are given below. Registration will define how incoming cards will be delivered; whether by direct collection from the Bureau, periodic collection from club distribution points or pre-paid mail-out to a private address. For resident amateurs in VK9 locations, the WIA Bureau service is available for those amateurs that are WIA members. Every month the WIA Bureau Managers receive an updated listing of all current WIA members to confirm membership. Verification of membership will be necessary for more recent Members that are not yet recorded on the monthly list. Bureau operating is a method of handling the incoming QSL cards received from overseas and interstate bureaus, as well as for outgoing cards. For outgoing cards the bureau receives cards for on forwarding and sorts them into the respective country order. Usually when an economical posting weight is reached, the package is posted. Incoming cards for VK amateurs are received at the National Incoming QSL Bureau, and are distributed to the State and Territory Bureaux, where they are then sorted and filed. Incoming cards are distributed to the State and Territory Bureaus at least every 3 months. Any inwards QSL cards received for non-members are stored (unsorted) for a period of time at the discretion of the individual QSL Bureau Manager. By arrangements with their State or Territory Bureau, and at a convenient time to the Bureau, non-members can peruse the unsorted cards, and extract their own cards. The outgoing QSL Bureau service is not available for non-members of the WIA. DXpedition and Special Event callsigns can generate thousands of outward cards, thereby incurring larger than normal postage costs. When the WIA receives an application for a Special Event or short term VK9/VK0 callsign, the application will be referred to the National QSL Bureau Manager, who will contact the applicant seeking details of how outward QSLs are proposed to be handled. Where applicants wish to utilise the WIA bureau for outward cards, they will need to complete an "Application to use WIA Outward QSL Bureau" form, available below on the WIA website. This form will be submitted to the WIA Board for approval, and, if necessary, to set any monetary charges that are to be paid by the applicant for the use of the Outwards Bureau. The IARU established a universal standard for QSL card production to improve the handling of cards by volunteers at Bureau offices worldwide, to assist with sorting, packing and posting. The recommended size should be no larger than 140 mm x 90 mm. It is recommended that paper size should be at least 0.25 mm thick. Copy paper is not deemed suitable and glossy photopaper with inkjet printing also causes issues. Matt photo paper is OK. The use of Double fold cards should be avoided. Cards not conforming to the standard size will be given lowest priority in sorting and sending. Members should deal with the Inwards QSL Bureau at the address listed for their area and the national Outwards Bureau at the address listed below. Please use the following email addresses as a point of contact for all queries and correspondence regarding your state QSL service. For VK9, please contact the National QSL Bureau Coordinator (email address below). If a WIA member makes an arrangement with the local QSL Manager for their cards to be sent annually, then the WIA will meet the cost of forwarding any cards received for that WIA member at their address on the membership list once a year. State and Territory Bureaus may enter into individual arrangements for more frequent deliveries that do not incur additional postage costs (e.g., Members provide SASE’s, drop off cards to Radio Clubs, etc.). Within this overall policy, management of the delivery of cards to Members will be determined by the State QSL Bureau Managers. When providing SASEs, it is recommended that a minimum envelope size of C6 is used, to cater for the varying sizes of cards that are received. WIA members who are members of an affiliated club may either directly or through their club request that their cards be sent to them at their club. Inward QSL Managers shall send WIA member cards to their club at such times as are economic having regard to the number of cards involved, but at least once a year. The WIA will meet the cost of sending the cards to the clubs. Members not requiring cards should notify their area QSL Manager directly. 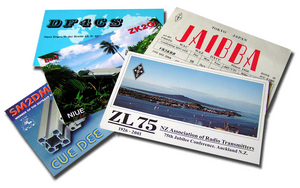 The WIA Outward QSL Bureau is a service for WIA Members only. Cards from non-members of the WIA will not be forwarded. Eligibility for sending outward cards applies only to the WIA Member’s home callsign(s) as registered within Memnet. (Note that this includes the callsigns of Radio Clubs affiliated with the WIA). Cards should be sorted alphabetically (A-Z and 1 to 9) into DXCC country order. Do NOT separate the country prefixes with paper, clips, rubber bands etc. Rubber bands should only be used to keep a large stack of cards together. Where cards are received at the Outward QSL Bureau that have not been sorted by the sender into preferred DXCC country order, these cards shall take the lowest priority for sorting and delivery to the overseas Bureaus. Where senders are identified as repeatedly not sorting their cards, they will be advised by the National QSL Bureau Manager that their cards will not be sent. Senders will need to provide a SASE for return of the cards. Please send outwards QSL cards at regular intervals to assist volunteer sorters and ensure a steady flow of cards. Affiliated clubs may collect cards on behalf of their WIA members and forward them in reasonable sized batches to the WIA Outwards QSL Bureau at the above address. The Outwards Bureau will confirm the WIA membership of the club members. Non-members cards will not be handled. When non-member cards are received at the Outward Bureau, they will be held while the non-member is given the option to either join the WIA, or send a Self Addressed Stamped Envelope (SASE) so that the cards can be returned. The National QSL Bureau Manager will be responsible for contacting the non-member. It is the responsibility of individual Members to send their outgoing cards to the National Outward Bureau. Where outward State Bureaus are established to aggregate Club member cards, and then send bulk cards to the National Outward Bureau, they cannot claim these postage costs from the WIA. Where State and Territory based Outward Bureaus are established, they must only forward cards from WIA Members, and ensure that cards are correctly sorted into DXCC country order. If you have any questions relating to the QSL service, please contact the WIA National and Incoming QSL Manager.